Indie Retro News: Sardonic - Another arcade shooter appears on the Amiga! Sardonic - Another arcade shooter appears on the Amiga! We are not finished with the Amiga news yet! As moments ago we were told that *ahem* Penisoft had released their Amiga game of ' Sardonic ', which looks to be a remake of a PC game they released way back in 2003. Now unlike the other game we featured previously, this one is a top scrolling shoot em up by MADAXE, and features music by FRED as both OCS/ECS and AGA versions requiring 1MB Chipram. 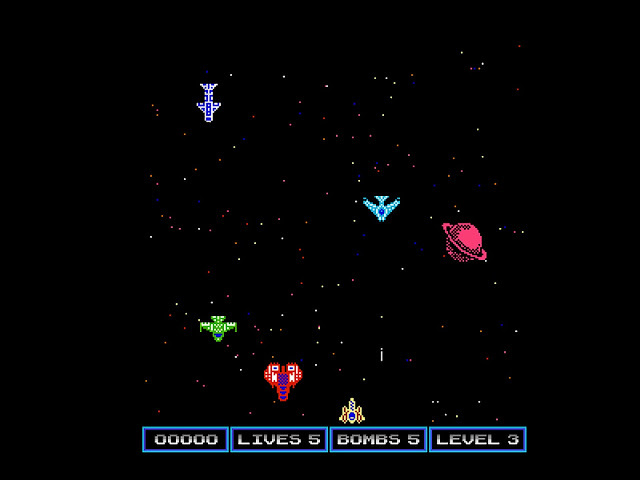 In this game you play as the yellow ship at the bottom of the screen and must make your way through the level blasting away enemies, collecting power ups, and destroying the boss at the end to continue on to an ever harder level. And that's pretty much it, as if you're expecting a very high quality in your face shoot em up you'll be disappointed, as although there's background graphics and a cool soundtrack, the enemy waves can become tedious and there's only a small amount of levels.